Chip Kelly reportedly appears to be a prime candidate to be the new head coach at the University of Florida. 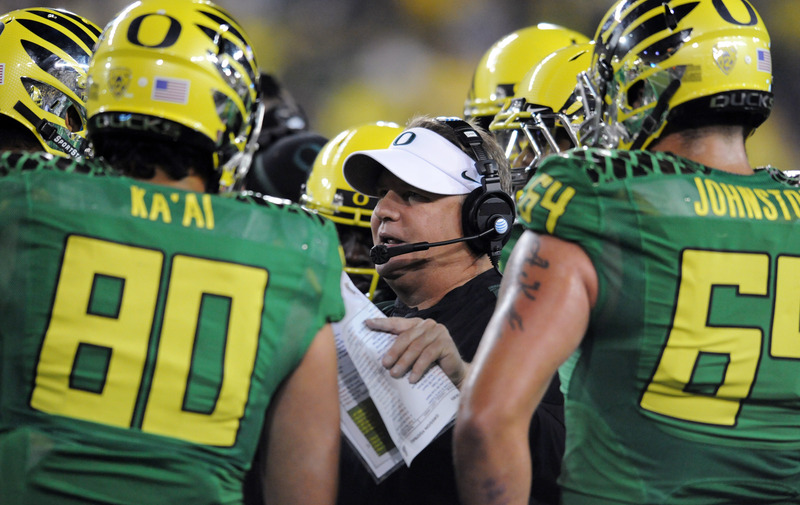 During his four-year tenure at Oregon, Kelly compiled a remarkable 46-7 overall record. Published on Monday, 11/13/17, at 1:23 p.m. Eastern. Are the Florida Gators closing in on hiring former Oregon and NFL head coach for both the Philadelphia Eagles and the San Francisco 49ers, Chip Kelly, as their next head coach? According to a tweet within the last hour from Darren Heitner, a sports agent, author and UF alum who was the first to report that Jim McElwain was going to be fired six hours before the Florida-Georgia kickoff in Jacksonville two weeks ago, the Gators are taking a hard look at Kelly and could make a decision on making him an offer as soon as this week. Confirmed that UF is looking at Chip Kelly as next head coach. Decision could be as soon as this week. Also heard that Florida was becoming very frustrated with Jimmy Sexton, who represents many other potential candidates. Chip is represented by David Dunn. There have been other reports out in the last 48 hours indicating that UF and AD Scott Stricklin were heavily vetting Kelly, who was issued a show-cause by the NCAA shortly after leaving Oregon for the NFL. Since its myriad of troubles with the NCAA in the 1980s from the tenures of Charley Pell and Galen Hall, Florida hasn’t been on probation in a major sport for more than a quarter-century. Before Stricklin can make this hire, the UF administration will have to be fully comfortable with Kelly and the details of what went down at Oregon as it pertained to the NCAA. Other than this potential roadblock, Kelly appears to be an excellent fit for the offensively-starved Florida fan base. To be kind, the Gators have been deplorable on offense since Tim Tebow left after the 2009 campaign. Kelly impressed all of college football and the NFL with his electric offense at Oregon. Kelly, who is still young at the age of 53, went 46-7 at Oregon with an incredible 33-3 record in Pac-12 play. He guided the Ducks to the BCS Championship Game in 2010 before they lost a heartbreaker to Auburn on a last-second field goal. Kelly also led Oregon to BCS bowl-game victories at the Rose Bowl and Fiesta Bowl. In his last three seasons at Oregon, his team compiled a 36-4 record. Kelly left Eugene to become the head coach of the Philadelphia Eagles. He guided them to an NFC East title and 10-6 record in his first season. In Year 2, he went 10-6 again but started to fall out of favor with his players. Then after Kelly was given full control of personnel decisions, he made several controversial trades of key players, further hurting his relationships with his players. After his third season with the Eagles ended in a 6-9 record, Kelly was fired. Next, he made a poor decision in accepting the head-coaching job offer with the San Francisco 49ers, who had a talent-thin roster. A 2-14 record prompted his dismissal, leading him to take an analyst gig with ESPN covering college football this year. If Stricklin can’t get approval from UF’s higher ups to make this hire, other potential candidates include UCF’s Scott Frost and Mississippi St.’s Dan Mullen. Frost and Mullen can’t be spoken to until their regular seasons are over and, as Heitner indicated, Stricklin has become frustrated in dealing with super-agent Jimmy Sexton, who represents many potential candidates and McElwain. Frost is also believed to be a candidate at Nebraska, which is expected to fire Mike Riley soon. The embedded tweets below show you how in front of the UF/McElwain story Heitner was a few weeks ago.